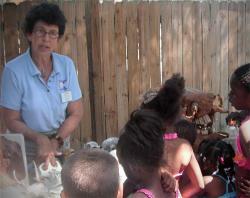 Valerie First is a docent at the Central Florida Zoo and Botanical Gardens, in Sanford, Florida, and the Orlando Science Center. She earned her BA degree from the University of Florida and is a member of the Florida Fossil Hunters, Tampa Bay Fossil Hunters, the Florida Paleontological Society, and American Association of Physical Anthropologists. Over the years as a docent, she has had to battle misconceptions about evolution and been confronted by a public unsupportive of the science. She sat down with us recently to share how she addresses evolution within her community, and why she feels it is so important. Q. How do you approach evolution when talking with the public? A. I talk in six minutes intervals MANY times during the day as a docent—this gives me very little time to get a lot of information across. As a result, I have to find good ways to demonstrate really big ideas, so I use fossils to talk about everything from diapsids/synapsids to humans. By the time I get to hominid “links”, evolution is starring them in the face. Q. What sorts of challenges have arisen as you address evolution? How do you deal with that? A. A lot of people are proud to tell me they “believe” in evolution and ask me how I deal with those that do not. They say it must be hard to talk about it every day. I tell them that an important purpose in life is to bounce ideas off each other and “evolve” intellectually. People that hold religious beliefs are happy to find out that religion is a separate subject and takes nothing away from science and vice versa. A simple point: bibles are not science books. I have had people named “Genesis”, listen to what I have to say and then say “cool!” I’ve had very distinguished-looking audiences who tell me they do not “believe” in evolution. I have talked with children whose parents are creationists. I find out because I hear the parents tell the kids that they will have to have “a discussion” with them on the way home. At least they have now heard about evolution. I deal with these challenges through my presentation style. I talk with authority, annunciate clearly and accent every second or third word as I point out features. I do not change my talk by second guessing what some might object to. Q. What would you say to others who are nervous about talking about evolution with a skeptical audience? A. What I would like is for other people to not be afraid. I have talked in schools and I will occasionally have a student with questions that challenge evolution. I listen and answer and that’s usually it. It’s not nearly as scary as it sounds. Q. Have you ever had a creationist come to one of your presentations? A. I love it when a creationist speaks up. Usually they spout something I’ve heard 100 times and if you calmly wait and listen, the answer is obvious. I love these discussions—it is a good mind exercise, plus I can build on my portfolio of responses. Q. Is there any particular approach that you’ve found useful in talking with creationists? A. When I have people who believe that God created humans, but do not believe in evolution, I often discuss ontogeny—development from a single cell to a human—with them. They will agree that ontogeny is amazing, and they will usually agree that science can explain how that development occurs without posing a threat to their faith. They can still believe that God created each and every one of us without denying what science tells us about the developmental process. They can realize that God can work through the processes that science studies. Then, whether they realize it or not, they’re halfway to seeing how they can accept the amazing explanation of the diversification of life that’s called evolution. Q. What do you think is the most important thing you convey about evolution? A. That we are related to all life and to each other. That seems to be lost in all the killing and arguing going on today. I feel in my talks that I am reconnecting people. Another important element in my talks is time. Some people in my audience think dinosaurs and “cavemen” were around at the same time. They think mammoths are dinosaurs. I hear these misconceptions all the time, so during my talk I emphasize that there were no people 65 million years ago. Not on this planet anyway! A. I love working in this niche and would love to see people doing this in our museums and zoos. It is so rewarding. I have had some teachers that love having me come and talk to their students, while others have told me that they are fearful of repercussions. That is a shame, but will hopefully change with time. Of course we must be tactful or we will be made extinct from these places of learning, and what may evolve from these niches is continued ignorance!